A great film is incomplete without good music. In fact, music happens to be the soul of a film. From the classics to the new-age cinema, music plays a key role in its commercial as well as critical success. Needless to say, it boils down to the genius of a music director to deliver the goods. There are numerous examples in Indian cinema where great music directors have catapulted an average film to greater heights. In his career span, Rath composed music for about 12,000 songs that included 150 Odia films, 300 album songs and 83 ‘gitinatya’ or musicals based on mythology. Not only Odia, he also worked for eight Bengali movies and did the background score for a Hindi movie ‘Kharabela.’ He last composed for ‘Tume Hin Sathi Mora’ which was released in 2015. As part of the series ‘Legends of Ollywood’, MCL had an exclusive interview with the legendry composer. Here are the excerpts. How Did You Start Singing And Playing Instruments? In Cuttack’s Chandni Chowk, there was this man called Sameer who I used to sit with near Mahanadi and listen to him singing. I also sang with him sometimes. I actually started singing when I was in Class 6. My father brought home a harmonium for my elder sister. However, she didn’t use it and it became useful for me. During my high school days, when I was living at my uncle’s place in Puri, I got the opportunity to play banjo and tabla. After that I learnt singing. G Narayan Rao was my guitar guru. I remember in the 60s, I coughed for more than 20 times during a stage show. That day I was so embarrassed, I felt like not singing ever again in my life but later changed my mind. How Was The Support From Your Family? My family was dead against my choice of profession. Only Bou (mother) supported me a lot while my father insisted that I focused on my studies. Tell us about your debut as a music director. In 1970, for the first time in Odisha, I played Spanish Guitar in two movies ‘Mana Akasha’ and ‘Dharitri’ but that was much before my debut as a music director for the film ‘Sakhi Gopinath’ in 1975. There were seven songs in the film including ‘Jamuna Jaona’ sung by Manna Dey and ‘Tume Mo Radha’ by Anuradha Paudwal. Those days, music was dull. I changed the scenario in 1976 with my film ‘Sautuni’ in which I introduced orchestra. In fact,it released before ‘Sakhi Gopinath’ the film I composed music for the very first time. I also started performing on stage in 1971 with the popular band ‘Cuttack Melody’. What Made You Take Singers From Bombay For Your Songs When You Could Have Roped In Odia Singers? There was a huge scarcity of singers back then.That’s why we had to engage singers from outside with particular voice and singing style to suit the music we composed. Bhubanahari first started taking Bombay artists in the film ‘Samaya’. I was the second one. We were recording at Bombay itself because there were no studios available here in Odisha. Have You Ever Wished To Sing Again? I have never wished to sing again but sang 1-2 lines of a song in ‘Puja Chandana’ because it was required. 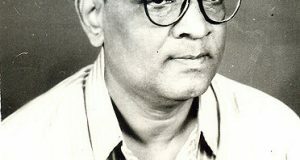 In that film, Khoka Bhai (Akhaya Mohanty) sang a very popular duet ‘Aji Mate Miligala Mo Mana Mayuri’ with Anuradha. I respected Khoka Bhai as my senior. He also worked with me as a singer in another movie of mine ‘Pratisodha Aparadha Nuhen’. Any Interesting Memory While Composing A Song? Yes. I had asked lyricist Surendra Bidyadhar to write a devotional song for the film ‘Aarati’. Ten days passed but he did not come up with anything. On 11th day, I cautioned him to deliver it by the end of day or I give it another guy. I remember, we were all sleeping in the night and Surendra was there too. Suddenly, in the middle of the night, he let out a loud scream. When we all ran to him, he said that he felt like receiving an electric shock. We found out it was a huge caterpillar on his thigh. We burst into laughter. Another writer in our team, late Sibabrata Das, said it was a good sign and the song will get huge appreciation. It turned out to be prophetic and the song ‘Maa Tume Jagatara Saha Bharasha’ became an all-time hit. The Odia Singer You Are Very Close? Share Any Memory With Him/Her. I am close to veteran singer Pranab Pattnaik. When we were recording the song ‘Maa Tume Jagatara Saha Bharasha’, there was a point where he had to go to a higher pitch. He tried about four times but to make it perfect, he went for it for the 5th time. Before that he said that would be his last attempt because it was very painful. Fortunately,he perfected the song that time. You Had A Love Marriage.Tell Us About That. Has Your Son Or Daughter Been Interested In Singing? I was teaching her guitar then and we started liking each other. We got married in 1973. Unfortunately, she passed away seven years back. My only daughter Bidisha Das is also a singer. She started singing when she was just six. For last five years, she has been running her own orchestra called ‘Chandana Orchestra.’ It has become very popular and they do many shows. I also sometimes perform on stage. Music Composers Of Your Time You Liked? I liked Shankar-Jaikishan and Hemant Kumar from Bollywood. Among All Of Your Songs, Which One Is Your Personal Favourite? Although I like all of them since they are my own creations, ‘Emiti Rati’ remains my personal favourite. What’s Your View On Today’s Music Technology? Back in our time, we could not edit any song in case of a mistake; rather we had to record the entire song all over again. Now with improved technology, you can easily cut or paste anything, even a word of a song. Why Do You Think The Modern-Day Music Does Not Last? Now songs do not have those heart melting lyrics or soulful music. So, they can’t be in the listener’s heart forever. Besides, everything is copied from other languages including music. It used to take us about two months to make six songs for a movie back then. Now the entire film is made within a month.